We had such a stress-free Saturday. My husband went to a gun show in search of a target shooting accessory, and I pushed the stroller through a neighborhood yard sale. (Later he told me that I should have come along--he finally figured out from the numbers of denim-skirted women and big vans that the area's homeschool convention was being held in the neighboring exhibit hall!). I sold two Lilly Pulitzer outfits (from the Salvation Army) on Ebay for a nice profit. Later we took a picnic lunch to the much-awaited opening of the outdoor swimming pool. The water was cold but clear and uncrowded. It was wonderful! I even had enough energy to whip up four dozen whole grain muffins for the freezer: banana nut, apple raisin, lemon blueberry and carrot bran. The whole house smells wonderful as they cool on the kitchen table! I even had all the ingredients I needed without having to make an additional grocery run. God is surely smiling on my family today! So how do you keep your children safe from your husband's guns? Just curious. I always worry about this. 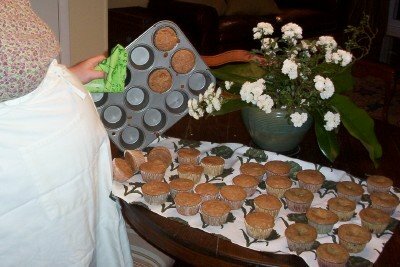 Just to say thats an adorable picture of you and your "bump" making muffins..........all of which sound wonderful ! You always overachieve, Meredith sweetie! I suggest muffins, and the next thing I know you are whipping up 4 dozen!?! To the anonymous poster about the guns-In our house we have a lockable gun cabinet, so all of the guns are locked up. Plus the guns and the ammo are kept separated. Before we had the cabinet we kept the shotguns & rifles up high on a closet shelf, or at my MIL's house, and the handguns were in a small locking safe (the fireproof kind). As for the types of folks who have kids and keep a loaded gun in their headboard or under their pillow, can I just say they are idiots? Mothersong, it's not overachieving--it's the hormonal urge to nest! Anon and Jenn, what few firearms my husband keeps for target shooting are triple-locked. Each gun has an external trigger lock,is kept locked in its own case, which is then kept in a locked cabinet. (All with different keys) When we first married I was very upset by the prospect of having guns in the house, but my husband went into super safety mode when my son was born without my ever having to nag. I think it's statistically more dangerous for your child to visit a home with a swimming pool than a home with firearms, anyway. Aww look at your cute belly! Do you think you could share your recipe for the lemon blueberry muffins. My hubby loves lemon things and I have some blueberries to use up before I can go pick more. Sounds like ya'll had a great weekend! My dad had a gun when we were growing up (He has quite a few more now) No locking gun cabinets or anything. I THINK I know where he kept the gun. No idea where the ammo was (and it may just been a BB gun? I think the ammo was rubber. But the gun looked real). It was in the parents' room where we weren't supposed to be in the first place. A few times, very special times, he brought the gun out with us to the backyard and taught us how to use it (I don't even remember if we were allowed to touch it) But we were taught very specific rules: Guns are not toys. We could only use the gun when our dad was RIGHT there giving us permission to do so. You never EVER pointed the gun at a person. Not for fun or teasing or anything. And the gun was a grown-up thing. I think he didn't want us to be afraid, but also didn't want us exploring our own curiousity so satisfied it by answering all questions we wanted. I never had an urge to go looking for the gun at any other time, so it must have worked. Boaz-Oh yeah, biggest thing ever taught by anyone who has guns (and hopefully everyone anyway) is ALWAYS ASSUME A GUN IS LOADED-even if you just looked in the breach or checked the clip. Every gun is always treated like it's full of bullets. Second biggest thing-you never point any gun, not even a toy one, at anyone. Period.